Precious metals rose Friday. Silver gained the most on the day but it sat alone with a weekly loss. As for gold, it finished above $1,300 an ounce and logged a second straight modest weekly increase. Gold for April delivery settled up $7.80, or 0.6%, to $1,302.90 an ounce on the Comex division of the New York Mercantile Exchange. "While primarily seen as a safe haven, gold is highly exposed to the emerging markets, which make up more than half of global demand, and China in particular," MarketWatch quoted Carsten Menke, commodities research analyst at Julius Baer, in a note. "An improving economic backdrop and strengthening local currencies versus the U.S. dollar bode well for gold demand. This is particularly true for China, where gold demand has been lackluster over the past few years, as consumers have become increasingly concerned about the outlook for the economy," Menke said. "Fourteen market professionals took part in the Wall Street survey. Nine participants, or 64%, described themselves as bullish for the week ahead. There were four voters, or 29%, who see a sideways market or else are neutral, while one respondent, or 7%, called for prices to decline. Meanwhile, 484 respondents took part in an online Main Street poll. A total of 270 voters, or 56%, called for gold to rise. Another 135, or 28%, predicted gold would fall. The remaining 79 voters, or 16%, saw a sideways market." Elsewhere, silver for May delivery tacked on 15.3 cents, or 1%, to settle at $15.324 an ounce. Silver futures inched 0.2% lower this week after climbing 0.6% last week. The precious metal is 1.4% lower on the year. April platinum rose $4.70, or 0.6%, to end at $831.80 an ounce, for a 1.7% weekly increase. Palladium for June delivery added $3.90, or 0.3%, to finish at $1,518.50 an ounce, jumping 4.1% on the week. Friday’s close was $1.20 away from matching palladium’s all-time record settlement. Both metals are higher on the year to date with gains of 3.9% for platinum and 26.9% for palladium. Gold rose $7.95, or 0.6%, to $1,303.50 an ounce. Silver added 12 cents, or 0.8%, to $15.355 an ounce. Platinum was unchanged at $831 an ounce. Palladium rose $6, or 0.4%, to $1,555 an ounce. 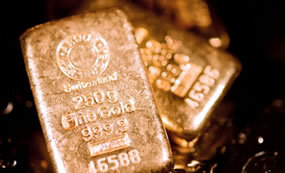 In LBMA results for the week, gains reached 0.5% for gold, 1.6% for silver, 1.6% for platinum, and 3% for palladium. Gold bullion coins jumped by 10,500 ounces after rising by 2,000 ounces last week. Splits included 7,000 ounces in American Gold Eagles compared to 1,500 previously and 3,500 ounces in American Gold Buffalos against 500 ounces previously. American Silver Eagles moved up 850,000 after coming in flat last week. On Monday, the U.S. Mint released its first 2019-dated America the Beautiful Five Ounce Silver Bullion Coin. The piece depicts Lowell National Historical Park in Massachusetts and it registered first-week sales of 80,000 coins or 400,000 ounces. American Platinum Eagle rose by 2,000 coins after registering flat last week.